Tilapia fillets lightly coated with panko, pan fried to crispy perfection, and served with a tangy garlic and lemon mayonnaise. If you’re wondering how to get your children to eat — or even love — fish, try feeding them this. They’ll think it’s kid-friendly food for them, but I promise you it’s anything but. These tilapia fillets are lightly coated with panko, pan fried to crispy perfection, and served with a tangy garlic and lemon mayonnaise. As far as I’m concerned, it’s the best way to transform ordinary tilapia into a seafood sensation. The great thing about this dish is that you can do most of the preparation ahead of time. Come dinnertime, all you have to do is throw the fish in the frying pan. You can also make a huge batch and freeze some before cooking, which makes for a quick and easy dinner another time. Gotta love two meals for the work of one. To make these tilapia fingers, simply cut your tilapia fillets in half. Leave the thin sides long and then cut the thicker sides in half on a diagonal so they appear longer. Next, bread the fish using the three-step breading method: first flour, then eggs, then panko. This will ensure a beautiful and crispy coating that will adhere evenly to the fish. Lay the fish fingers on a baking sheet and season with them salt and pepper. Looks good already, right? Coat a non-stick pan generously with olive oil and pan fry until crisp and golden. Sprinkle with salt, dip in Lemon-Garlic Mayonnaise and enjoy! Cut the tilapia into "fingers" by first cutting the fillets in half. Leave the thin sides long, then cut the thicker sides in half on a diagonal so they appear longer. Set up three large shallow bowls in an assembly line. Put the flour in the first bowl; the beaten eggs in the second; and the panko in the third. Line a baking sheet with aluminum foil. Dredge the fish fingers in the flour mixture, shaking excess into the bowl so just a light coating remains; dip in the eggs and turn to coat evenly; then dredge in the panko, turning several times to coat evenly. (This can be a messy job...it's best to use one hand for the flour and eggs and the other for the panko.) 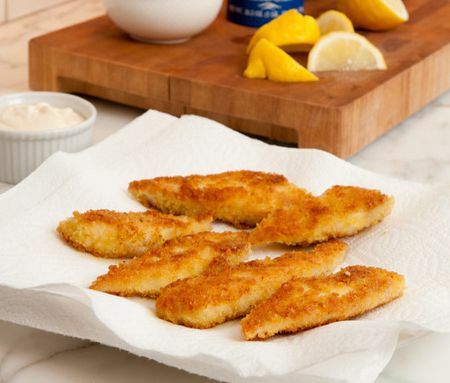 Set the breaded tilapia fingers on the prepared baking sheet and season with salt and pepper. Cover and refrigerate until ready to cook (this can be done several hours ahead of time). Line a plate with 3 paper towels and set by the stove. Coat a large non-stick sauté pan generously with olive oil and place over medium heat. When the pan is hot, place the first batch of tilapia fingers in the pan (do not crowd) and cook until the first side is golden brown, 2-3 minutes. Flip and continue cooking until done, about 2 minutes more. Transfer the fish fingers to the plate with paper towels and let sit for a minute to drain any excess oil. Remove any brown bits out of the pan, add more oil if necessary and continue to cook the fish in batches until done. Season the cooked tilapia fingers with more salt if desired. Serve with lemon wedges and Lemon-Garlic Mayonnaise. Mix the mayonnaise, garlic and lemon juice in a small bowl. Add salt and pepper to taste. Freezer-Friendly Instructions: Lay the tilapia fingers in a single layer and wrap well with aluminum foil. Place in a freezer bag in the freezer. When you're ready to make them, simply defrost them enough so they'll lay flat in the pan and cook as directed above. I love the idea of home made fish fingers! I’m excited to try them with my son (we are doing baby led feeding and I think they would be the perfect size for his little fingers!). Could I use haddock for this recipe? Specifically I would like to buy a big bag of the frozen haddock from Costco and use that. I know I probably can’t thaw, bread and refreeze if I use frozen fish but do you think I could freeze it after it it cooked and just reheat in the oven? Your thoughts as always are appreciated! These were AMAZING I make lots of fish recipes and had put these on “back burner”…my 87 yr old in-laws visiting from St Louis said it was among best fish they’d had. I went to sprouts and got fresh tilapia. Made tarter sauce (from crab cake recipe) and it was perfect! This is one of the meals my son most requests. Since he does not put any lemon mayonnaise on the fish, I add some Tony’s or Old Bay seasoning to the breadcrumbs to add more flavor. Just made these this afternoon and they’re delicious. Lol, no big surprise there! What a fortunate find your website and book have been for me. Anyway, my only substitution was lemon-infused olive oil instead of regular for half the batch. Both were fantastic. It’s the first time I’ve used the three step method. What a great job it does. Thanks, Jenn!! This tilapia fingers was very delicious, it was a big hit, the sauce was so good! I have made this recipe several times and it is delicious as written. I substitute gluten-free for the bread crumbs and flour and it works out great! We especially love the lemon-garlic mayo! Wow, my kids ate this. All 3 of them (8, 6, and 2). They even asked if we could have it for dinner again soon. 5 stars!! I made this dish t2 days ago!!! Came out amazing!!! Beyond delicious! I’m going to feature it on my blog mealswithmark.com of course giving credit to where I got the recipe!! Thanks again. I will never eat fish sticks any other way! Glad you enjoyed them and thanks for letting me know you’ll be sharing the recipe! I made this dish last night with a healthy version of ‘chips’, and it was a total hit! The fish came out perfectly, and the sauce was a delightful addition. Thanks so much! These were super easy (although, as you said, messy) to make, and I loved being able to “bread” them hours before frying them. Everyone ate them enthusiastically. Another terrific family recipe from Jenn! Thank you for a recipe that my fish hating family loved. made them look like nuggets. my boys loved it. I love this recipe! Making it again tonight. Hi! Can I prepare these the day before cooking? These look delish! Yes Lori, this recipe is perfect for that! You can also make a double batch, freeze 1/2 before cooking, and defrost them for another dinner. Made them tonight and they were great! Crispy and light… my super-duper picky eater liked them too! I froze the uncooked batch and am looking forward to an easy weeknight meal. Thank you for another fantastic recipe! Yes Lariza, I think you could. I would suggest baking them first and then finishing them off under the broiler. Hope you enjoy! This was such a simple and easy recipe to make! I thought the lemon-garlic mayonnaise was perfect for the fingers. I was happy to see you could make these ahead of time. It was great coming home and grabbing them out of the fridge, ready to fry in the pan. Another great recipe, Jenn! I just love everything you share with us. Thank you. Made this on Friday night for our family and it was a big hit! My boys (ages 5 and 3) finally ate fish! I do have a question- I froze some to make for dinner in a week or 2. Should I thaw them overnight in the fridge? I’m afraid the breading will fall off. Hi Sara, So glad your boys enjoyed it! And, yes, I would recommend thawing overnight in the fridge. Made this for a group of adults and kiddos and everyone enjoyed it. The lemon garlic sauce is fantastic. If you want leftovers, best to cook them as you plan to eat them–the crust is wonderfully crispy when just cooked, but a bit soggy the next day. Still good, of course! Next time I will freeze what we don’t eat immediately. This will be a keeper. I love all of the recipes I have tried from your site. Unfortunately, my seven year old daughter has a severe tilapia allergy. What white fish would you recommend as a good substitution for any of your tilapia recipes? Suzanne, any other thin white fish such as flounder, cod or catfish should work! The Crispy Tilapia fingers were outstanding. I have tried many of your recipes and have yet to try one that wasn’t outstanding! I have gotten some friends hooked as well! This was delicious!!!! The only change I made was that I had some lemon/dill compound butter that I used to cook fish in! I will be making this many times in the future! Had a Caprese Salad with balsamic glaze on the side. This is a great go to recipe. My Grand Daughter loves fish and wants this all of the time. I make extra and freeze it for a quick meal for her. You did it again. With the lemon wedge drizzle and the lemon garlic mayo… tilapia never tasted so good. Love your tips like slicing the thicker side at a diagonal to create an illusion of length and designating a wet hand and dry hand. This is a great fish stick recipe using Tilapia which is so mild flavored! The dipping sauce pairs wonderfully with this. Easy to make – a great quick meal which ends up with me giving the recipe to all who try it! All I can say is WOW! I’ve fried fish before but who would have thought that just using panko crumbs would make the fish so light and crispy! Also the fish came out very flaky. Definitely using this recipe again. By the way I rarely leave comments but this was totally worth it. So glad you enjoyed, April! This was awesome! I did tweek this a little bit. I seasoned the fish 1st with salt and cayenne pepper for some kick. I also added some parm to the panko. For the garlic mayo I subbed 1/2 sour cream and 1/2 mayo, no salt needed. Heated up leftovers in the oven and made yummy fish tacos. Thanks. The Tilapia Fingers are delicious. It’s so hard to get my kids to eat fish… my daughter went back for thirds and even requests this dish for dinner. Thank you! Do you use tilapia out of the seafood case or frozen? Hi Sharon, I use fresh but it’s fine to use frozen; just be sure to defrost before proceeding with recipe. These turned out amazing! Loved the sauce too! This was without a doubt a five star recipe for making fish at home. The recipe is easy to follow and the fact that the fish can be prepared ahead makes the preparation and clean up a snap. 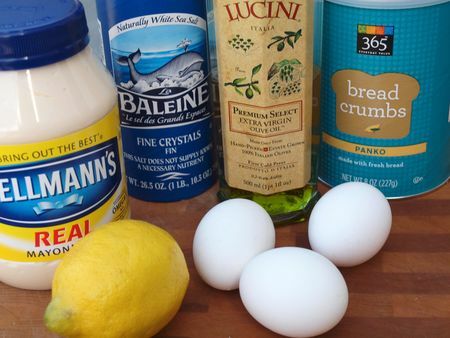 Be sure to make to lemon/garlic mayonnaise it is the best I have ever tasted. The fish can be reheated the next day and tastes as good as if it were fresh cooked. I hate frying food! Can these be baked in the oven? Maybe finish them with a little broiling for extra crunch?? Hi Janet, Yes, but I would spray them with oil first so that the breadcrumbs crisp up. How does the cooking time differ if you bake & then broil them? Hi Marlene, I prefer these cooked on the stove, but you can bake them at 350 degrees for about 25 minutes or until they are golden and flake easily with a fork. (I would spray them with oil first so that the breadcrumbs crisp up.) Hope you enjoy! My little one loves this! So easy to make. Great recipe! What is the best way to reheat after freezing? Hi Michelle, I would reheat in a 350 degree oven. Another winner with my kids! Thanks again for a simple, straight forward and delicious recipe. I froze half the batch and look forward to another easy and tasty meal in a few weeks. You occasionally publish calorie counts but not for the tilapia fingers and for other recipes. Without knowing the calories in a dish, I won’t try the recipe no matter how fabulous it seems. I control my weight by consuming a limited amount of calories. I hope you will publish this type of information more frequently in the future. I’m giving this recipe a 5 star because I know it would be amazing if I did make it. Thank you. Hi Glynis, You could easily substitute halibut or cod. Hello Jenn, thank you for sharing your knowledge and your great website. Question…how do you feel about prepared garlic in a jar ??? A lot of your recipes call for garlic and chopped or minced garlic in a jar is easy to use. Don from New Jersey. Hi Don, I don’t love prepared garlic in a jar because the preservatives give it an off taste. I would say it’s fine to use it in a pinch, but only in recipes where the garlic gets cooked; not in salad dressings, dips, etc. Hope that helps! What would suggest to go with the crispy talapia? ? Hi Fanny, My French green beans with shallots or roasted broccoli would both be good. Can I use catfish instead. I did your peruvian chicken and Mexican rice and french string beans with shallots and the green sauce. I LOVE YOU IT CAME OUT JUST THE WAY I HAD IT AT A PERUVIAN RESTAURANT. YOU ARE AMAZING,the recipes are so simple to follow. My grandson is going to learn how to cook b/c of u he loves to be in the kitchen he is my little helper. Hi Fanny, Yes, any white fish will work with this recipe — just be sure to cut the pieces the same size as shown in the photos so they cook properly. (Tilapia is pretty thin so the inside cooks through just when the outside is crisp and golden.) So glad to hear you are enjoying the recipes! This was awesome. I had to use butter instead of olive oil though. Very tasty treat! This is THE best fish recipe ever! Even people who don’t care for fish seem to enjoy it. The garlic mayo makes it addicitng. Wonderful–and so easy too. I made these tonight with cod and even my fussy “I never eat fish” daughter scarfed them down. I was out of panko so I used Italian bread crumbs and it still work great! These were really tasty! I only had Italian style panko crumbs and I used coconut oil to fry them, and they turned out delicious! I have 2 kids, 6 and 3, and everyone was happy! A keeper in my family!! Loved this, very easy but I thought the fish needed a little extra seasoning, maybe some cajun spice added to the flour. Next time I will get some good french bread, lettuce, tomato and make these into Poor Boys with that sauce they will be AMAZING! I do no comprehend the necessity for this step, I thought at first they would be baked, put on sheet just to salt and pepper? Hi Pavlo, You have to put them somewhere, especially if you want to prep them ahead of time and store them in the fridge, and a baking sheet is just the right size. A plate would be too small. These were very yummy. I made no changes in the recipe, and my family enjoyed every bite. My kids really ate these up. Added lemon pepper seasoning to the flour. Worked really well. I made them last night and my three, and 5 year old boys went back for seconds. They loved them we all did. Everything from everyone’s plates was gone. I never thought of cutting up the fish into fingers,,,great idea. Great Friday-fish night meal. Is there a need to season fish with salt and pepper before dredging procedure? Hi Mary, No it’s not necessary. A trick from my mom included putting the fish in milk then flour then panko. Does the egg make them fluffier? Hi Lauren, It makes the panko stick better. My wife and I made these a few weeks ago, and they were phenomenal! Even our picky-eater 14 month old daughter loved them (her first fish dish that she liked). We of course made too much, so we froze the leftovers for later. With a quick reheating at 350F in the oven they were just as good the first go around. For the mayo-dip I jazzed it up a little bit with some fresh dill, made it pop, just a little bit more. Keep these wonderful recipes coming! Thanks for the simple recipe! I was planning on Tilapia tonight, but wasn’t sure how I wanted to cook it. I needed something kid friendly, and sure enough it was a hit! My 20 month old and 5 year old gobbled them up quickly. I made some tartar sauce instead and it tasted great! Thanks for a go-to recipe! These are perfect to throw in tacos with lettuce, cheese, and a zesty aoili! Will this be just as good baked and not fried? Hi Eliana, Probably not. Sorry! I make these for my daughter instead of buying frozen fish sticks, and she loves them. She even asks me to make them for her. The one thing I don’t do is the mayonnaise sauce since she likes to dip her’s in ketchup. Can’t wait to try this . I like that you can prepare then freeze them. We had halibut on hand so we used that instead, and they disappeared! Delicious! Have tried this with a little diversion and it is so yummy, Anything that is seafood is better than meat.. These were a hit- the kids gobbled them up. Great recipe. This is the recipe that got my family hooked on Tilapia. So easy and so delicious. Thank you! So delicious! This has become a staple in our house – the tilapia always comes out perfectly crispy and the lemon-garlic mayo is the perfect accompaniment. My family loves tilapia, so I have made your tilapia fingers with garlic mayonnaise many times. Even my 2 year old will eat it! I like, too, that I can assemble the tilapia (bread them and stuff) then put them in the fridge until it’s time to cook! Super easy and super yummy! Delicious! Made this tonight and my hubby couldn’t get enough. We will definitely keep this one hand. I made this tonight and my guy and 6 yr old daughter gobbled it up! YUM. I am making this tonight!! My husband made this recipe without changing a thing, except we baked the fish, and it was really great! mmm fish and chips might be on my menu this week! Hi, I made these tonight for dinner and they were very, very good. Quick to put together and very tasty indeed. I will be making these on a regular basis. Made these for dinner last night and, WOW, sooo yummy. Even my picky kids ate them. Love the recipes…keep ’em comin! I can’t wait to try this, I know from experience panko is good on anything. Never tried it with Mayo base……this should be entresting. Just wanted to let you know we made your tilapia fingers. SO GOOD! My mom was here and everyone loved them– simple, easy and delicious! Tried this and the whole famly loved it. The dipping sauce was delicious! I’ve stumbled upon your blog and I soooo will try this!!! I’ve made breaded tilapia before but not with panko!! Looks easy! Thanks! Those look so good! can you make me some for lunch?